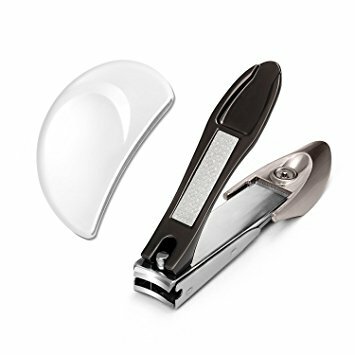 Have you ever tried to use a set of nail clippers that were cheaply made and left a jagged edge or didn't cut through your nail? I have it's not pleasant. That's why I wanted to tell all of you about this Nail Clipper Set by Hfun. They are sturdy and durable, the top is made from Zinc Alloys and the bottom is #304 Stainless Steel. The blade is very sharp and cuts tough and thick nails with one try. Leaves a smooth, clean edge. The handles are extra long and wide giving you more control and confidence with each clip. There's a built in nail file in the handle as well. This set comes with a pair of nail clippers, a brush to clean it with and a crescent shaped nail file. Makes a nice gift or stocking stuffer. It is hard to find good nail clippers.